Since VMware is forcing the webgui for their vSphere client; you will require the vSphere plugin to be able to upload files to the datastore. however the plugin doesn't work on every browser; Chrome and IE are the only ones I found that works...sometimes. However, there are other ways to accomplish this: PowerCLI. The task isn't to hard; VMware has a KB on how to do it. 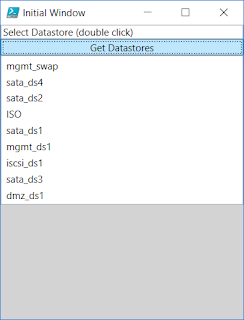 Basically you need to connect to the vcenter server, get the datastore and folder (if needed), map a PSDrive to that datastore, then run the Copy-DatastoreItem command. Simple right? It is for an experienced administrator. But I like to make things even simpler; why not build a UI for it using XAML and PowerShell? 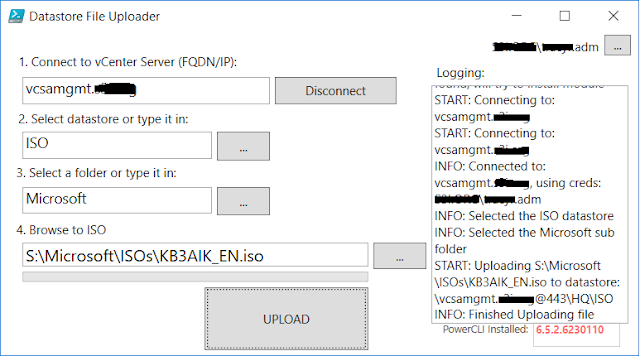 It will also store the last used vCenter/IP in a file under your temp directory. I thought about making a dropdown list for it for multiple vCenter scenarios.